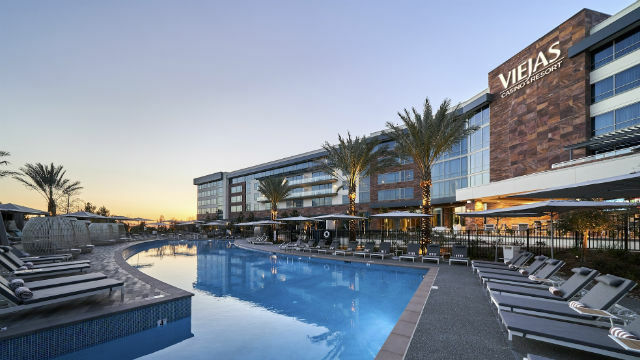 Viejas Casino & Resort announced this week the completion of a seven-year renovation and expansion that included three new hotel towers and a redesign of the entire property. The final part of the project was development of the adult-only Willows Hotel & Spa with 159 suites, spa facilities, a fitness center, signature restaurants and an expanded gaming space. The project included a 15,000-square-foot, high-limit gaming area and large new center bar. The 1,900-square-foot bar has 50 seats with gaming machines and 18 65-inch televisions wrapping around the entire bar. “Our new center bar, which is the biggest in the San Diego area, will be a popular meet-up point in the casino. We’re looking forward to having our guests finally experience it,” said Welch. The casino, which is located at Interstate 8 and Willows Road in East County, will be hosting a series of events during a grand opening weekend Oct. 19-21.